The ongoing debate over the NFL’s handling of player concussions has finally reached the courts in a slew of recent lawsuits. Since July, at least a dozen suits have been filed on behalf of more than 120 retired NFL players and their wives. The retirees claim that long-term neurological complications associated with concussions were well known and documented and that the NFL knew or should have known about them. Some complaints allege that the NFL knew and deliberately misled the players about the risks of head injuries and that NFL protocol was to return players who sustained a concussion to the game in which they suffered the injury. 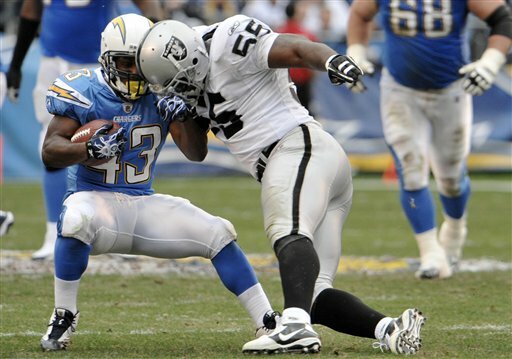 Raiders linebacker Rolando McClain hits Chargers running back Darren Sproles in game on December 5, 2010. Sproles stayed down after the hit until team trainers attended to him. 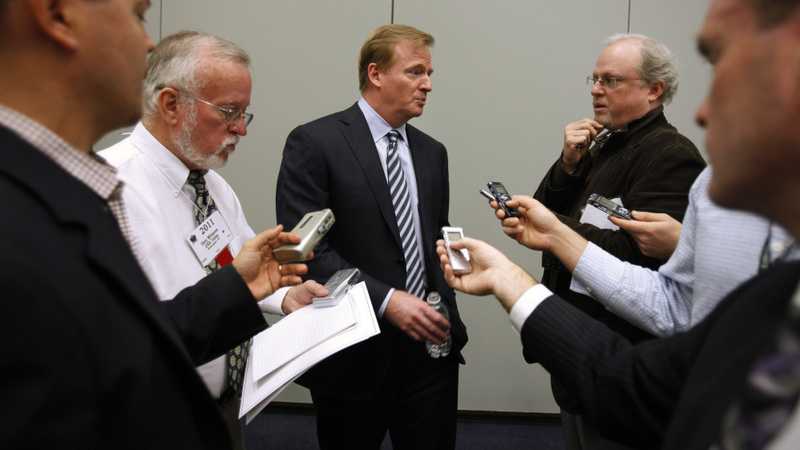 In response to these allegations, Brad Karp, outside council for the league insisted, “[t]he NFL has never misled players with respect to the risks associated with playing football.” The NFL also maintains that the sport is inherently risky, that the players knew of the risks of injury and chose to play anyway, and that the league did not engage in any misconduct or illegal behavior. Jacksonville Jaguars running back Maurice Jones-Drew has even asserted that the possibility of sustaining a serious football injury is simply an “occupational hazard.” In a recent interview with the Associated Press, more than 50% of the 44 players polled admitted they would try to hide a head injury or concussion to stay in a game. NFL Commissioner Roger Goodell answers questions after addressing the concussion issue before the Congress of Neurological Surgeons in Washington, D.C. Both the league and the players face significant challenges in these suits. The NFL will have to deal with negative publicity while trying to get the cases dismissed; the retirees will likely struggle with causation problems while fighting to ensure these cases appear before a judgeto prove causation, try to show there was not an assumption of the risk, and argue that their claims should not be barred by the applicable collective bargaining agreements. The NFL has already scored a victory in this legal battle by convincing one federal judge that any claims by the retirees should be addressed under the collective bargaining agreements (CBAs) they signed during their football careers. The CBA requires that any disputes arising from the agreement be resolved through arbitration. However, the players maintained that because they are retirees, they are no longer subject to those agreements. They also argued that the evidence revealing they were not sufficiently informed of concussion danger came out only after their careers ended. This is but one of the many obstacles facing the retirees. Another perhaps more significant obstacle for the retirees will be proving that the concussions they sustained while playing in the NFL caused their current health issues, rather than any injuries suffered in college or high school, or other general age-related causes. It may also be difficult for these retired players to prove that the league intentionally concealed information from the players regarding the dangers of repeated hits to the head. The league will undoubtedly emphasize its recent safety initiatives and policy changes, including banning of dangerous activities involving helmets and fining players who engage in prohibited helmet-to-helmet hits and implementing a post-concussion system where doctors must examine players before they are allowed to play again . While the players seem to have the tougher case and greater legal hurdles, their cases will at least raise awareness of the seriousness of sports-related head trauma and will emphasize to current players the importance of protecting their heads in the game and their futures in the CBAs. Steelers quarterback Ben Roethlisberger removed from field after suffering a concussion in a game against the Browns. The Fordham Sports Law Forum is dedicated to bringing interesting issues in sports law to the Fordham legal community. Each week, in conjunction with the Intellectual Property, Media & Entertainment Law Journal, members of the Fordham Sports Law Forum write posts about current sports law issues and events.